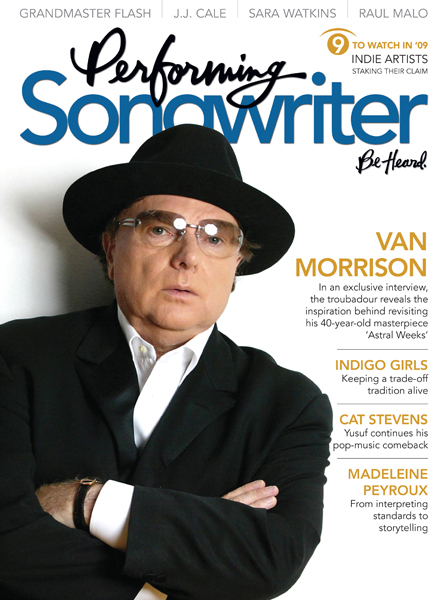 A rare interview with Van Morrison, plus the Indigo Girls, Yusuf/Cat Stevens, J.J. Cale, Ian McLagan, Peter Collins, Lee Ritenour, Ruthie Foster, Sara Watkins, Bell X1, Gramercy Arms, Justin Townes Earle, Raul Malo, Madeleine Peyroux, Grandmaster Flash and Liz Rose. Special Feature: 9 to Watch in ’09 (Arizona, Black Cherry, Samantha Crain, Hacienda, Here We Go Magic, The Love Language, Alice Russell, Twilight Hotel and Winter Gloves). Jill Sobule’s regular column on showcasing, Behind the Songs story on Janis Joplin’s “Mercedes Benz”. Henry Diltz’s Parting Shot: Neil Young with Art the dog.